In this article we are going to see Snapshot Standby Database in deep. In snapshot standby type database stays in a read,write mode that is fully update-able database. Snapshot standby database is created by converting physical standby database into a snapshot standby database. When standby database is converted into a snapshot database , it receives redo data but , it does not apply that redo data from a primary database. The redo data is kept in a standby database server . Once snapshot standby database is converted back into a physical standby database , it discards all local updates done in a snapshot database and then applies redo data kept in a standby server. 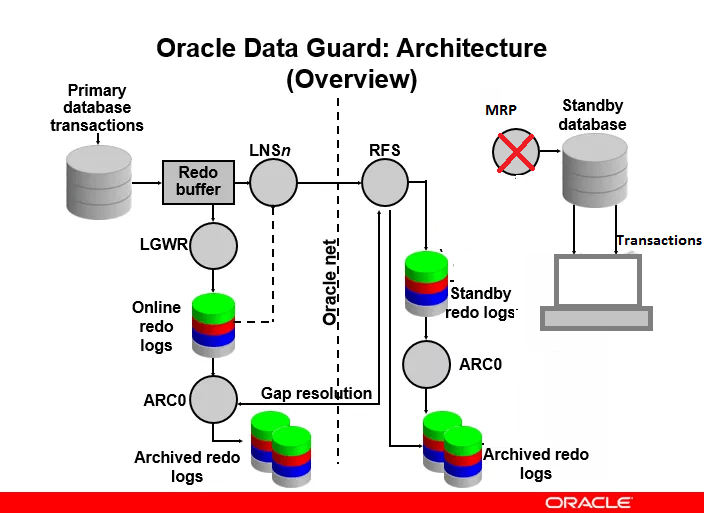 We can see in above diagram , every process that works in data guard , works fine here except MRP process. When database is converted from physical standby database to snapshot standby database , MRP process is on hold. Redo are generated from primary and recorded to standby in archive log files. When a physical standby is converted into a snapshot standby , an implicit guaranteed restore point is created for the standby database. Flashback database is used to facilitate this functionality.And redo data are kept on hold. As snapshot database is on fully update-able mode , we can do transactions on standby database.We can say snapshot database is cloned copy of primary database. After completing our task when we convert standby database back in Physical standby database, all DMLs performed are discarded till that recorded restore point. DMLs will be rolled back and redo data remaining to apply will be applied by MRP process.